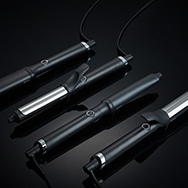 ghd Stylers offer you the very best in salon professional heat styling. Top stylists, models and celebrities alike can't live without their ghds, so you know you are in good company. Your ghd IV styler not only allows you to straighten your hair, but also curl, twist, flick, wave and bounce, you can achieve just about anything that you can think of. The ghd styler range gives you ultimate control. Discover ghd’s SMART styler that predicts your hair’s needs. The Platinum+ styler adapts to your hair to deliver the optimum temperature of 185ºC to give you a super-sleek and smooth result in one single stroke. The breakthrough technology has predictive sensors to determine hair thickness and the speed at which you're styling, adjusting power and heat accordingly. Add effortless texture and volume to your hair with the ghd Contour® Crimper. Whether you're adding subtle crimp to the ends of your hair or throughout the lengths and brushed to add instant body and volume, this hair crimper adds a playful finish to your hair. Style your hair beautiful with the ghd Curve range! This curlers has a protective cool tip allowing the user to hold the hair in a safe place and also features a built-in safety stand. The Ghd air has a motor and patented removable air filter. Delivering high pressure air flow for super-fast drying while advanced ionic technology reduces frizz and flyways to give a smooth salon-style finish in half the time*. The ghd hair dryer was designed by professionals for professional and offers you the best hair drying experience at home. Variable power and temperature controls, plus the choice of two nozzles, allow you to tailor your blow-dry to your hair type, while a cool shot button. Within the ghd styling collection you will find the ideal product. Creating dramatic looks, incredible volume, strong but flexible hold, manageable control and texture. These ghd styling products will naturally promote elasticity and provide incredible hold while retaining moisture making them ideal for use when heat styling. Each product contains a heat activated shield to instantly protect hair whenever heat is applied or simply when heat is manually created through brushing. Find all ghd essential accessories to boost style and shine for a salon-finish result! ghd hair brushes are used in many salons and are perfect for you to use to style your hair at home. View all ghd products in one place. Not sure what you are looking for? Simply select your hair type and product type. A decade on from revolutionising hairstyling with the launch of its first hair styler, ghd remains true to its founding ethos—the spirit of transformation. Staying true to its name, a good hair day is guaranteed with the use of ghd products. From the iconic ghd straighteners and ghd stylers, which continue to be a cult must-have for women in search of beautiful hair, to the ghd hairdryers which promise salon style in half the time, ghd products combine style with styling, making sure your dresser looks as chic as your hair. Top stylists, models and celebrities alike can’t live without their ghds, so you know you’re in good company when you add to your collection. Whether using your ghd styler to tame frizz for a day at your desk, or to curl locks for a night out on the town, ghd not only allows you to straighten your hair, but also twist, curl, flick, wave and bounce too. With ghd, the possibilities are endless. #TeamGorgeous headed to Gorgeous Hairdressing to get the low down on a key wedding look. Giving you ultimate control of your hair, ghd’s range of brushes innovatively style hair without causing static, helping to create the optimum silky smooth blow-dry. The ghd Ceramic Brush features a ceramic barrel to retain heat too, making sure your blow-dry is super speedy and the natural bristles on the Natural Bristle Radial Brush work to create a smoother finish, adding volume to mid-length hair. In addition to its iconic straighteners, the collection also includes ghd Curve, which enables you to curl your hair as desired. Featuring ghd tri-zone technology, the ghd Curve range also features automatic sleep mode, keeping you safe while you style. And ghd don’t just leave you with brushes and stylers, their range of hair treatments and styling products also includes the ghd Style Final Fix Spray to offer humidity-resistant, firm and flexible hold and the ghd Advanced Split End Therapy Treatment which instantly fills and smooths split ends to replenish moisture and strength to damaged hair. 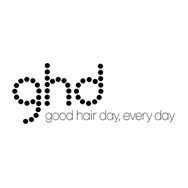 GorgeousShop is your place for all things ghd hair.